The budget may bring stamp duty changes and funding for new homes but will it fix the housing market? Yorkshire experts give the chancellor their advice. Sharon Dale reports. Nicholas Pleace, Director of the Centre for Housing Policy and Professor of Social Policy at the University of York. “The bigger strategic issue that the government has to face is that this is not just a question of housing supply, it is about broader economic policy. “Building houses in affluent places like London, the south east and high value areas of Yorkshire is not going to solve the issue of affordability. They will still be expensive. “Neither does it address problems in areas where house prices are low and supply is plentiful but there are issues around jobs and the quality of employment. “We have a situation now where if you want certain careers and job opportunities you have to move to particular parts of the country to get them. We need to balance out the economy so we are not creating unnatural pressure in London, the south east and the cities. It’s about equality and creating opportunity for better quality jobs in other areas where house prices are lower. “Look at the housing market in Middlesbrough and compare it with London and we can see that London is hopelessly overheated. We need to examine the economy in areas like Middlesbrough and ask how we can make it better. That’s why we need development and why the idea of a Northern Powerhouse is a good one. “I also believe that housing supply needs to increase across the board. We aren’t building enough homes and a lot of what we do build is not good enough quality in terms of space and energy efficiency. Building on flood plains should also be forbidden. “There’s a big problem around affordable housing and not just in London. In York, a lot of jobs, such as those in the tourism industry, are low paid and many workers are part of the gig economy, which means it’s harder for people to afford private rentals and to pay mortgages. “If you think back to how social housing developed, it was because the housing market did not work. Poverty meant that people lived in slums. Mark Manning, a director of Manning Stainton estate agents. “Let me challenge the suggestion that the housing market is broken. I suggest that in the Yorkshire region, the market has issues but is not entirely broken. “There is no doubt that in London and the south there are serious problems surrounding affordability for those looking to buy or rent their next home. In London, for example, the average house price to earnings ratio stands at 11.98 times. “However, 200 miles up the M1, a slightly different picture exists. Here that ratio falls to 5.70 times. 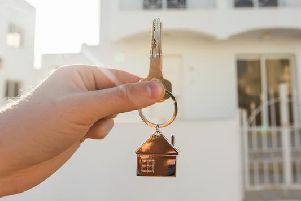 “This year so far, Manning Stainton has seen a six per cent increase in the number of first-time buyers agreeing a deal to buy their first home. This figure is 37 per cent higher than the same period in 2013. So it is an improving picture. “This growth has been underpinned by a relatively healthy mortgage market with lenders continuing to project increased availability of money for those looking to make their next move. Annual lending figures for 2017 are projected to finish at around £248billion with further growth predicted for 2018 and beyond. “Without question the need to see an increase in the volume of new homes being built across the region remains our biggest challenge. In Leeds, for example, the council set a target to build 70,000 new homes in the next ten years but on current build rates, it will fall well short of that. “Addressing this isn’t easy as most large developers will understandably phase their developments to ensure they aren’t over exposed to the market, while also ensuring supply to the market is controlled. Jon Charters-Reid, of Charters-Reid Surveyors, a surveyor, trained joiner and also a member of the Association of Building Engineers. “One of the first things I would do is get rid of stamp duty for properties under £250,000. The second is to invest in pre-fabrication. We can’t build houses quickly enough the conventional way and there is a skill shortage, so it’s obvious that prefabricated homes made in a factory is the way to go. “I also believe that we should be building more terraced housing. It’s space-saving and energy efficient. If we built the properties with mansard roofs, we could have parking on the ground floor, bedrooms on the first floor and living space on the second floor. “We mustn’t forget planning. The planning system in this country is archaic and under resourced so I think we need to look back to the interwar years, 1919-1939, when the rapid expansion of housing was a great success story. “At the moment, local authorities have allocated land for development but it can take forever to get permission to build on it. We should have a two-year moratorium on planning and strip all the bureaucracy out of the process. Then the sites identified in the development plan could be fast-tracked and awarded planning permission with set rules attached, which would leave a developer good to go. “The section 106 agreements, which specify that private developments must have a certain percentage of social housing, are a financial burden for developers and that can be a deterrent to building. We need to reduce that percentage. “I grew up in a council house so social housing is very close to my heart. I agree with right to buy but more government funding is needed to build more social housing.